Which Memories do you want to preserve for your family and friends? Learn skills and tips to help craft your own personal stories so they will be cherished for years to come. 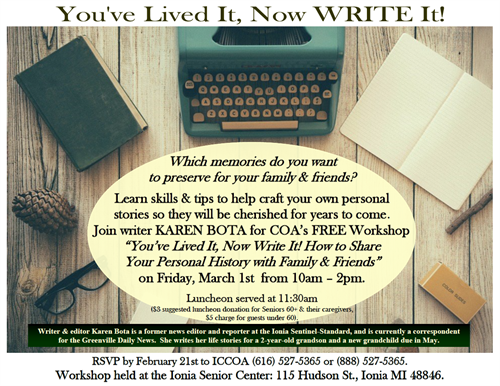 Join writer Karen Bota for COA's free workshop "You've Lived It, Now Write It! How to Share Your Personal History with Family & Friends" on Friday, March 1st from 10am - 2pm. Luncheon will be served at 11:30am. $3 suggested donation for Seniors 60+ and their caregivers, $5 charge for guests under 60. RSVP to ICCOA at (616) 527-5365. Workshop held at the Ionia Senior Center: 115 Hudson St., Ionia MI 48846. Writer and editor Karen Bota is a former news editor and reporter at the Ionia Sentinel-Standard, and is currently a correspondent for the Greenville Daily News. She writes her life stories for a 2-year-old grandson and a new grandchild due in May. Free Workshop. Luncheon: $3 suggested donation for Seniors 60+ and their caregivers, $5 charge for guests under 60.